Easy-peasy, quick shortbread recipe that celebrates any fruit in season -peaches, in my case here! Healthier version too, as it uses wholewheat and amaranth flours instead of refined flour. Oh, and did I mention an apricot jam filling and dollop of cream on top? Pair a biscuit-y, crumbly slice of this with some piping chai and your favorite book; you can thank me later! My obsession with healthy baking is becoming a thing – the joy of baking your own delicious cake or a batch of cookies is something else altogether, and it’s such a relief to know you’re eating real ingredients you put in it, sans any additives, sodium, bromide and tons of sugar! As is becoming a norm with me, this recipe is free of refined flours like maida/ all-purpose and refined-sugar free too, as I’ve used wholewheat and amaranth flours for the base and palm sugar for the sweetening. The apricot jam I’ve used is free from added sugar (grab one from FabIndia today!) and whipping cream used has minimal sugar content. If you are watching your weight or your calorie intake, simply avoid the cream topping. Also, it is entirely possible to celebrate any fruit in season – use strawberries, blueberries, oranges, plums or apples as you like. Did you know that whole amaranth grain has much higher content of lysine (an amino acid that the human body cannot produce on its own) than any other grain, making it a rich source of protein? Lysine also helps in better absorption of calcium, thus ensuring better bone health. 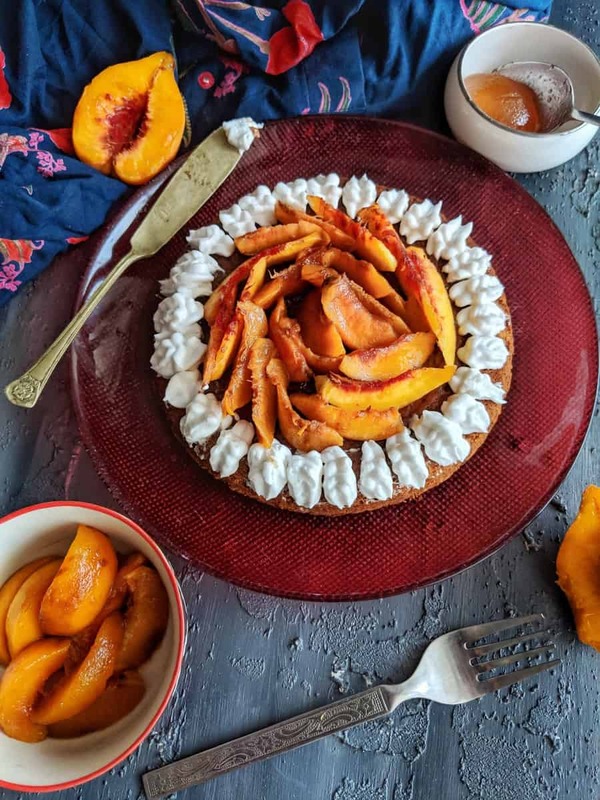 If you’re looking for more healthy baking ideas, do try my other recipes like Mango Saffron Oats Whole-wheat Muffins, Wholewheat Banana Bread or Cherry Upside Down Ricotta Cake! Grease and line a 6-inch pan, preferably springform. Using a hand-mixer, whisk together softened butter and powdered palm sugar in a bowl until it’s light and fluffy. Crack in one egg. Once it’s combined, add flours, salt, baking powder and whisk until well-combined. Press down the dough in the springform pan and smooth the surface. Chill the pan in the refrigerator, preferably overnight or at least for 6-7 hours. Pre-heat the oven at 175°C for ten minutes. Bake the biscuit base for 25 minutes until golden brown and crumbly. Release the springform and after the biscuit base cools completely. Meanwhile, add double cream, sugar and vanilla essence in a bowl and whisk for about two minutes until soft peaks are formed. Take water in another small bowl, dissolve agar agar powder in it and heat it in the microwave for 30 secs. Add the warm mixture to the whipped cream and whisk again for minute so it gets fully incorporated. Scoop the whipped cream into a piping bag/ bottle. Spread the apricot jam with a spatula onto the biscuit surface, taking care to leave the edges for piping the cream. Arrange the macerated peach slices on the jam layer. Pipe the whipped cream onto the biscuit base edges in preferred pattern. *Recipe is for 7 servings; all values in grams.